The South Korean Won is the official currency for South Korea. Jeon is the monetary subunit for the currency of won. However, the term jeon is no longer applied to everyday transactions and is only used within the context of the foreign exchange market. 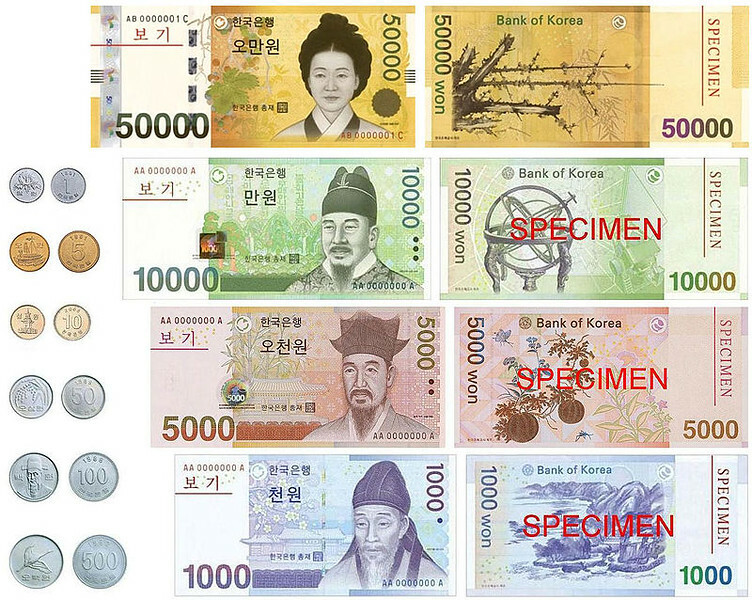 The Bank of Korea is designated to issue the currency’s banknotes and coins. This is located in Seoul, the country’s capital city. During the colonial era, the won was replaced by the yen as the official currency of South Korea. But after the end of the Second World War, Korea was divided and as such two types of currencies emerged. The North and South Koreans had their own currencies although they were both called won. The South Korean won was initially pegged against the US Dollar in terms of its market value. However, the won was hit by further devaluation as a result of the Korean War. In 1953, the Korean Won was replaced by hwan. Also, during this same era, the banknotes for the Korean currency were released via the Bank of Joseon. This was prior to the establishment of the central bank, which is Bank of Korea, which is currently the one issuing banknotes and coins for the entire country. The second major development for the South Korean won took place in 1962 when it was re-introduced (to replace hwan). It became the official legal tender of South Korea in 1975 – this means any last of the remaining hwan coins were withdrawn or no longer in use. The won was still not able to escape devaluation as the currency was largely hit by the East Asian financial crisis. Currently, there are four types of coins available in circulation. These are the 10 won, 50 won, 100 won, and 500 won. As for the banknotes, there are also multiple series that were released into the market. There are four series of banknotes in total starting in 1962, 1962-1969, 1972-1973, and 1983-2002. In 2006, there was a lot of problem with counterfeiting for the South Korean Won banknotes. This prompted the government to issue new banknotes that were re-designed and enhanced with security features (there were 10 in total). Some of these security features were also found on other major currencies such as Canadian Dollar, Euros, Pounds, and Japanese Yen. Even the newly minted coins also had a substance to it that makes it easy to detect against counterfeit coins. The South Korean Won has been one of the top performing currencies in Asia. This is due to the stability and growth of the economy in South Korea. They are one of the world’s largest automobile producers, ship builders, and is home to many large construction companies. The official symbol for the South Korean Won is a capital letter ‘W’ with two parallel lines across it. South Korea is the sole user of this currency. It is not used outside of South Korea. The official printer of banknotes is the Korea Minting and Security Printing Corporation. Meanwhile, the coins are minted by the Korea Minting and Security Printing Corporation. As of February 2016, the inflation rate of the South Korean Won is at 1.3%.